Carrara White 12x12 Split face. SOLD BY BOX OF 10 TILES / 10 SFT. Carrara Marble is one of our highly popular and most cost effective stone tile and mosaics. Carrara marble is an exquisite combination of whites and grays with medium to high variation. It is mostly demanded by those house owners and interior designers, who want Italian touch and feel without the pinch in their pocket. 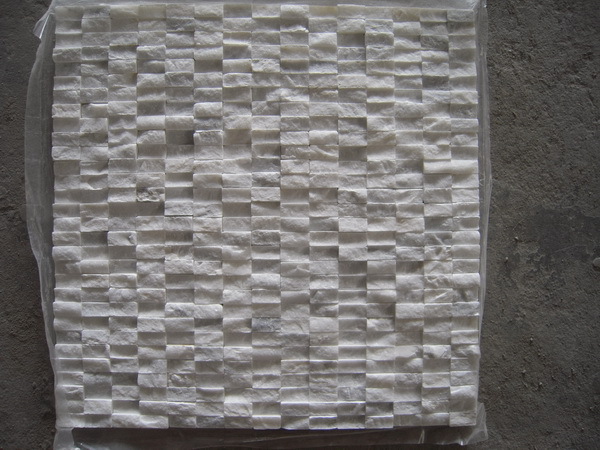 In this section, we have assorted some of the most popular varieties of marble tiles of Carrara Series. It highlights the best of available options from our collection that have been well appreciated by our clients. Style Has Changed: Only Purchase If The 4th Pic is What You Want! I wanted a sparkly white, subway-laid out mosaic, like the 1st, 2nd, 3rd & 5th pics posted. What I got was what you see in the 4th pic posted: More grey (not white), stacked vertically (not railroaded aka subway style), and NO sparkle whatsoever. Thank goodness it was only a sample. In short: if you like the way Japanese Rice Paper candies look, then get this tile. The wallandtile customer svc rep said that vertical stacking is the "new" look. If you still like the "old" look, then hey--you've been forewarned! I really hated my kitchen and after installing this backsplash the countertops (which I still plan to replace) don't bother me quite as much. Very happy with the results.